There are about 90 species of whales distributed in all of the world’s oceans. 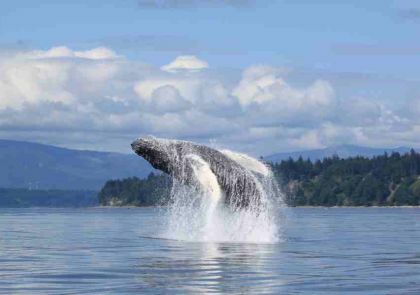 In our marine waters, adjacent to and only minutes away from Farewell Harbour Lodge, we are blessed with some of the best whale watching opportunities on the entire planet. Whales fall into 2 main classifications, Mysticeti, or baleen whales and Odontoceti, or toothed whales. Our main viewing opportunities are for Orca, dolphins and porpoises which are in the Odontoceti order and for Humpbacks which are in the Mysticeti order. Orcas, dolphins and porpoises are all part of the Delphinidae or Dolphin family of Odontoceti, or toothed whales. At Farewell Harbour Lodge, we head out almost daily in search of all three with a primary focus on Orcas. Orcas are incredibly intelligent, highly social animals with a very sophisticated inter-species language. The Orca along the BC coast have been categorized by scientists into 4 main communities — the southern residents, numbering perhaps 80 animals, near southern Vancouver Island, the offshore community foraging along the continental shelf, the transient community who roam extensively along the BC coast and the northern residents, numbering close to 200 animals, who feed in the Broughton Archipelago and northern Vancouver Island near Farewell Harbour Lodge. Click on the video link to listen to some amazing Orca vocals! The resident and transient communities are very different in a number of important respects. The residents feed primarily on salmon and the transients feed primarily on marine mammals - seals, sea lions and even large baleen whales. 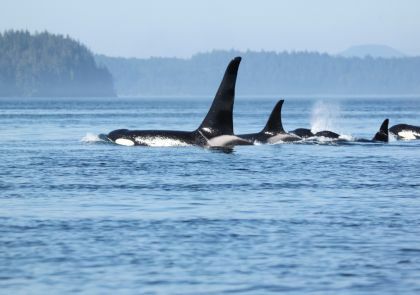 The social structure of Orcas is based on matrilines with powerful familial bonds where family groups are based around a mother and her offspring. Humpbacks that we see in our waters spend summers and part of the fall in our cooler temperate waters before heading off to Hawaii to mate and calve in the winter. Humpbacks are known for their elaborate feeding behaviour known as bubble netting where they use rings of bubbles blown through their blow hole along with the differentiated coloration of both sides of their pectoral fins to ‘corral’ herring and other baitfish that they feed on.